Ridetek was originally founded as part of the Transport Driver Training Corporation, over 15 years ago. We have now opened additional training facilities at Sandown Racecourse [Noble Park]. In 2008 Ride-Tek MTA moved it’s offices to Sandown Racecourse. 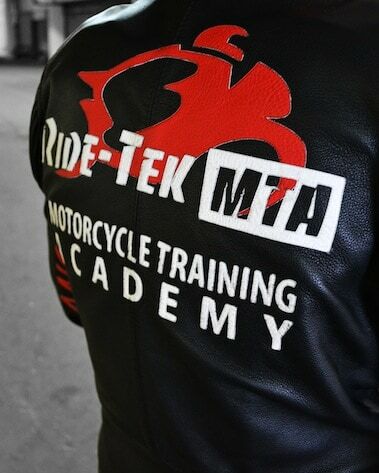 When training with Ride-Tek MTA, you will be taught how to ride a motorcycle safely, not just how to pass the test at the end of the day. This objective is met by the combined experience of Mel and his team of instructors’ which spans far in excess of 65 years. All are still very active and enthusiastic motorcyclists. In support of our belief in our proven training methods – if you do happen to fail your Learner Permit Course and Assessment we will offer you three hours of remedial training absolutely FREE to help you build your skill and confidence level before re-sitting the assessment. To find out more about Ride-Tek. Click on the Video below. Ride-Tek MTA is a Victorian Motorcycle Training Organisation accredited by VicRoads to issue Motorcycle Learner Permits and Motorcycle Licences in the state of Victoria. Our training facilities based at Sandown Racecourse in Noble Park and Hammond Road in Dandenong are state of the art, boasting a full riders training ground. Our fleet of Honda motorcycles and scooters meet all current safety standards and regulations. Helmets, gloves and wet weather gear are provided free of charge, if required or you may prefer to bring your own gear if you already have it. Our job is to make sure you meet the skills and the legal requirements to obtain your Motorcycle Permit or Pass your Motorcycle Licence Assessment. We provide courses seven days a week catering for every level of experience. Our philosophy has always been to provide riders with “real-world” skills rather than simply teaching them how to pass a test! Your safety matters to us and we want to ensure the maximum safety aspects are applied to your motorcycle riding skills and attitude.